First missing UK schoolgirl named. The first of four missing London schoolgirls who have travelled to Syria has been named as Sharmeena Begum. The 15-year-old, from Bethnal Green, is thought to have left the UK in December to join Islamic State (IS) militants. Sharmeena's father told the Daily Mail he had warned teachers at Bethnal Green Academy to keep an eye on three of her friends who have since disappeared. 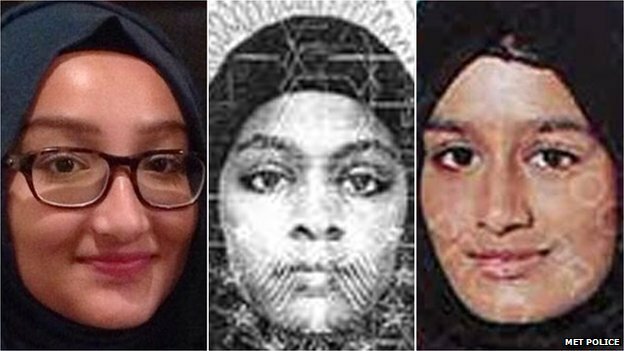 Amira Abase, 15, Shamima Begum, 15, Kadiza Sultana, 16, are now believed to have joined her in Syria. All four teenagers are thought to be in Raqqa - the headquarters of IS. Sharmeena Begum's father Mohammad Uddin told the Daily Mail he had warned the police to watch out for her three schoolmates after his own daughter went missing, as they were best friends. 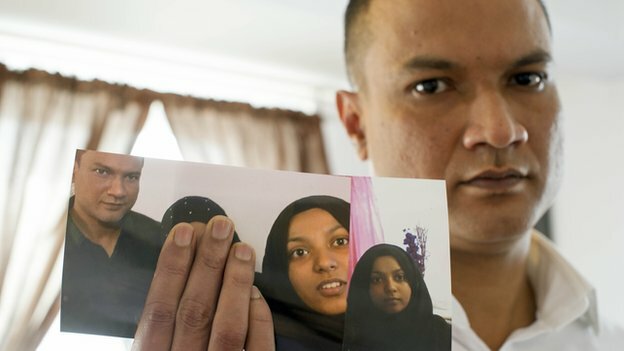 Mr Uddin, a waiter at a central London restaurant, told the paper: "I said [to officers], 'Keep an eye on the three girls, maybe they'll give you a clue.'" He also said he believed Sharmeena had been groomed by extremists who targeted her via social media on her phone. His daughter's behaviour changed after her mother died in January 2014 and she developed an intense interest in Islam, Mr Uddin told the newspaper. He said: "I thought this was normal because she lost the closest person to her, and she's an only child. Before then she wasn't very religious. She wouldn't go to the mosque and she would wear English dress. "But then she changed her dressing style and wore a scarf and started praying five times a day." Mr Uddin believes his daughter was groomed by two young women who took her to the airport and made sure she caught the flight to Turkey. She is thought to have been in the country for a few days before travelling on to Syria. The Daily Mail reported that two weeks after she left home, Sharmeena called her father to say: "I'm in Islamic State and I'm not coming back." Rushanara Ali, MP for Bethnal Green and Bow, said more needed to be done to find out what had convinced the girls to travel to Syria. "I asked the Prime Minister for an inquiry into what happened here so that agencies, front line workers as well as families and the wider community can get the help they urgently need to protect young people. "This is a relatively new phenomenon and uncharted territory for all of us. We need practical help for people working with young people." She added that the government needed to work together with the Turkish authorities to prevent people getting into Syria. Shamima and Amira, who are both 15, and 16-year-old Kadiza Sultana - all GCSE pupils at Bethnal Green Academy in east London - left their homes on 17 February. They flew to Istanbul from Gatwick with Turkish Airlines and are believed to have travelled to Syria within days. New video footage emerged on Friday apparently showing Amira, Shamima and Kadiza preparing to enter the country. The footage, broadcast by Turkish network A-Haber, seems to show a man helping the girls into a car near Turkey's border with Syria and appears to contain a reference to Syrian passports. It is believed to have been shot by a man later arrested for allegedly helping the trio to cross the border. Turkey's foreign minister has said the man is an intelligence worker. He worked for the intelligence agency of an unspecified country that is part of the coalition against IS, according to Mevlut Cavusoglu.